What is causing my truck to vibrate when I reach a certain speed? We are sure that you already know a least a few of the many causes for vibrations. The real problem is eliminating all of the possibilities one by one. At Plaza Fleet Parts we can check out and fix many of the conditions involving steering, clutches, wheel bearings, driveshafts, etc. that normally cause vibrations. If you have balanced your wheels and experience vibrations regardless of the trailer you are pulling, let us check the balance on your driveshaft. Disconnect and bring us your driveshaft and we will test it on our balancing equipment. It is a test that takes very little time, covers the full range of speeds at which your driveshaft rotates, and often answers the question of why you have vibrations when you reach a certain speed. Like tires, driveshafts should be balanced. A driveshaft on a vehicle usually rotates at a higher rate of speed than any of the tires. On most trucks that’s between 1,600 and 2,300 rpm. Plaza’s balancing equipment can simulate speeds in this range and higher. Our equipment can detect even the smallest imbalances that might eventually lead to bigger trouble. You can learn more about our high speed balancing equipment here. Plaza has not only the equipment but also the expertise to balance any driveline. With a complete understanding of balancing, our re-built and custom-built drivelines perform like new and better. It is also not necessary to bring in a vehicle for us to rebuild the driveline. Just bring in the driveline. 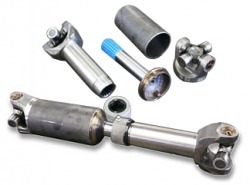 We will also repair or custom make a PTO shaft. We also do a great job balancing drive shafts for race cars! If the above diagnostic tools can't shed any light on your problem, just call us. We will be happy to advise you regarding problems with any type of shaft on any vehicle.